1. Weight filling machine adopts PLC and touch screen which make the filling equipment easy to operate. Our Filling machine 5L kg to 25L. It is especially suitable for quantitative filling of water aqua, edible oil and lubricating oil. 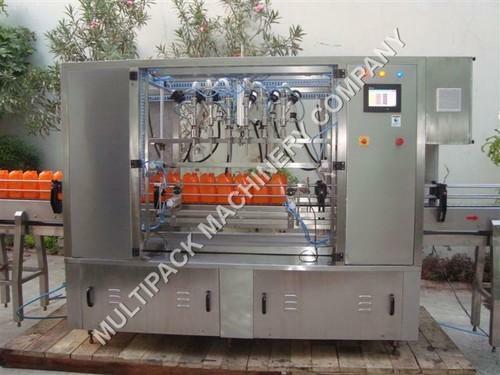 Liquid filling machine is idea packing machine in foodstuff, pharmaceutical, cosmetic and chemical industries. 2. Liquid filling machine adopts diving type filling method, which effectively reduces bubbles. Besides, it is able to filling materials with different characteristics. 3. Each filling head of weight filling machine is equipped with weighing and feedback system. It is able to carry out filling volume setting and micro adjustment for filling quantity. 4. Electric elements such as photoelectric sensor and proximity switch all adopt advanced sensing elements. The host machine will alarm if there is any container blocked. 5. Weight filling machine is designed according to GMP standard. It is easy to clean and maintain. 6. The material contacting parts and exposed parts are made of stainless steel. The whole filling machine is safe, eco-friendly and hygienic. It is suitable for various working places. Multipack Packaging Machinery was established in 2008 and is operating as a successful manufacturer, exporter, supplier and importer of Filling & Packaging Machines. Our product range includes Shrink Sleeve Applicators, Shrink Tunnels and Stretch Wrapping Machines. We provide Maintenance Services. The offered machines are capable of filling & wrapping bottles & containers of various shapes & sizes. Multipack Machinery Company offers secondary packaging machinery including shrink sleeve applicator, shrink tunnel, wad inserting machine, induction cap sealing, carton, roller conveyor, stretch wrapping machine, BOPP/OPP hot melt label applicator, cup rinsing, filling and sealing machine, filler, capper, labeler machine, auto l-type sealer , Shrink Wrapping machines etc. Multipack is Leading mfg of Shrink Sleeve label applicator machine for Pharmaceuticals, Chemicals, Cosmetics, Minerals, FMCG, Spices and other agro products, Tobacco, Ayurvedic Herbs, Paints, Plastics, Ceramics and many other various fields bottle, jar , tin and vials shrink Sleeve labelling machine. Multipak provide a great low cost service and excellent machinery. From initial enquiry through sales, installation to support thereafter. Multipak are the best choice!